August 01, 1968, M Richter. 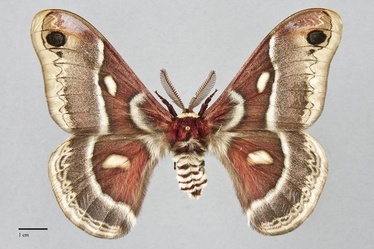 Hyalophora gloveri is a very large moth (FW length 51–67 mm) with red-brown and gray forewings marked with broad white lines, large white discal spots, and an eye-like black spot near the forewing apex that is restricted to the eastern and southeastern parts of the Pacific Northwest. The wings are broad with a broadly hook-shaped apex. The color basal to the postmedial line is red-brown, but the subterminal area is powdery dark gray. The wing margins are pale tan. The black and blue spots below the apex of the forewing are surrounded by violet and pink. The antemedial and postmedial lines are black bordered by broad white opposite the median area. The former line is arched toward the outer margin and the latter is gently sinuous, oriented at a right angle to the trailing margin. The subterminal line is black, scalloped. The hindwing is similar to the forewing in color and markings, although the submarginal wing has a lace-like pattern of dark and pale. The discal spots are black filled with cream and orange. The forewing spot is ovoid while the hindwing spot is similarly-shaped but rotated 90°. The underside is similar to the dorsum but brown-gray. The thorax is red-brown with a white collar. The abdomen is banded red-brown and white. The antennae are quadripectinate, much wider in males than in females. 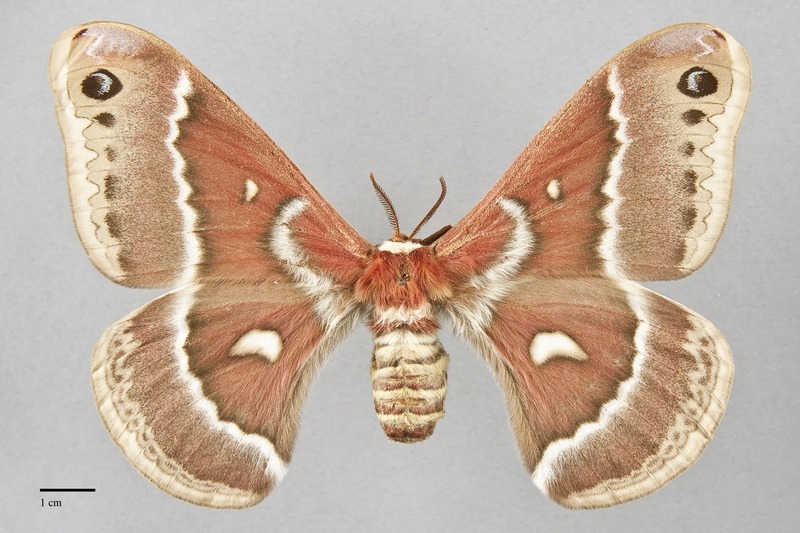 This species one of two very large red-brown members of the Giant Silkworm Moth family Saturniidae in the Northwest. It can usually be distinguished from Hyalophora euryalus, the much more common and widespread species in our region, by its gray rather than reddish subterminal areas and the compact shape of the hindwing discal spot. This spot is sickle-shaped with a very long lateral limb in H. euryalus. 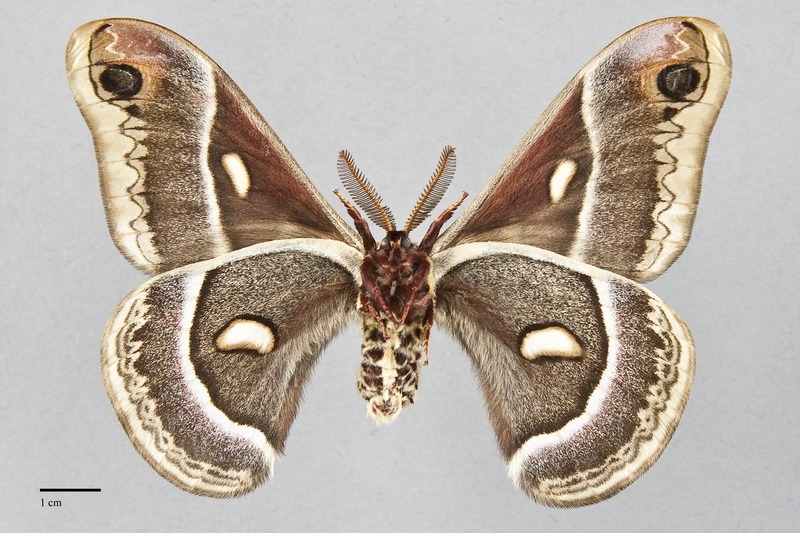 Hyalophora gloveri should only be expected near the eastern borders of the Northwest region. 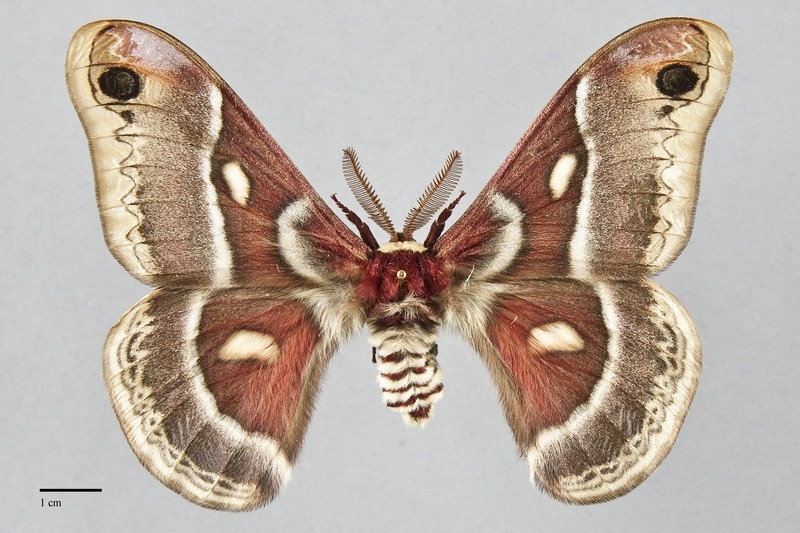 The relationship of this moth to the northeastern North American taxon Hyalophora columbia has been debated vigorously in recent decades. The western taxon gloveri was first treated as a subspecies of H. columbia by Collins (1973). It has even been proposed that gloveri should be considered to be a subspecies of H. euryalus (Tuskes et al. 1996) because of hybrid zones where they come in contact at the margins of their ranges. A detailed discussion of this situation and a convincing argument that H. gloveri and H. columbia are best treated as separate species is presented by Schmidt & Anweiler (2010), based on foodplant and habitat preferences, differences in mitochondrial DNA, and the results of rearings. The habitat of this species in the Pacific Northwest appears to be limited to riparian habitats or montane shrubland at middle elevations in the Great Basin region. This species has a limited range in the Pacific Northwest. It has been found only in southeastern Oregon and southern Idaho and is replaced by H. euryalus elsewhere. Hybrid zones with H. euryalus exist in this region (Tuskes et al. 1996). Hyalophora gloveri is widespread to the east in western Alberta and Montana. 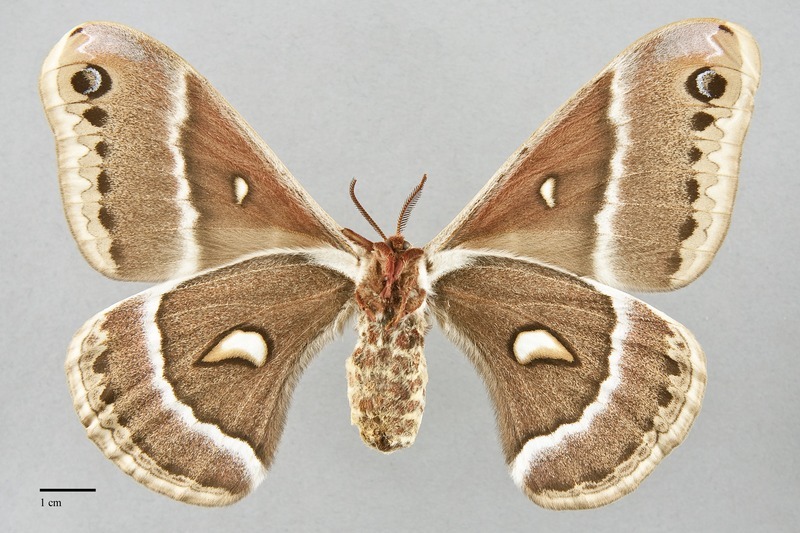 Hyalophora gloveri is broadly distibuted in the West. It occurs from the Canadian Prairie Provinces to northern Mexico through the western Great Plains, Rocky Mountains, and Intermountain Region as far west as eastern California. This species appears to be a general feeder on broad-leaved shrubs and trees. Published foodplants include willow (Salix spp.) in the Salicaceae, cherry (Prunus spp.) in the Rosaceae, alder (Alnus spp.) in the Betulaceae, currant (Ribes spp.) in the Grossulariaceae, and buffalo berry (Shepherdia canadensis) in the Elaeagnaceae. The records from our region are from late spring and summer. This species is nocturnal and comes to light. The adults do not feed.